What Will Trump, Putin Talk About, Agree to? The Presidential Palace is pictured in Helsinki, Finland on July 14, 2018, ahead of the meeting between U.S. President Donald Trump and his Russian counterpart Vladimir Putin. This file combination of pictures shows Russian President Vladimir Putin, left, and U.S. President Donald Trump. 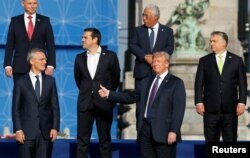 NATO Secretary General Jens Stoltenberg, Poland's President Andrzej Duda, Greek Prime Minister Alexis Tsipras, U.S. President Donald Trump, Portugal's Prime Minister Antonio Costa, Hungarian Prime Minister Viktor Orban pose for a group photo at NATO meeting. They have expressed fears that Trump, who last week berated NATO allies, and hinted unless they increased their defense spending rapidly, he'd consider pulling the U.S. out of the nearly 70-year-old security alliance, will be lured by the more experienced summiteer Vladimir Putin into offering concessions — possibly agreeing to lift sanctions imposed on Russia for the 2014 annexation of Ukraine’s Crimea. Some media commentators have suggested Trump might even agree to recognize formally the annexation — predictions the freewheeling U.S. President prompted after telling reporters on Air Force One on June 29 that he might consider doing so. “We're going to have to see,” Trump said. 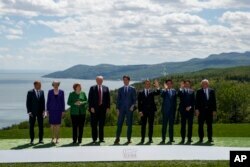 FILE - G-7 summit participants pose for a family photo in Charlevoix, Canada, June 8, 2018. He told France 24 that he’s certain Trump won't negotiate about Crimea during his meeting with Putin. So what will the two men talk about in Helsinki? Trump has declared no issue off the table. And in the past few days he has reiterated his desire to establish warm relations with Putin, saying he doesn't see him as an enemy but as a competitor, who might one day become a friend. Not since the Cold War have relations between the West and Moscow been so fraught with clashes over Russia's 2014 annexation of Crimea and its pro-separatist operations in eastern Ukraine, as well as its military intervention in Syria. There are also ongoing disputes over nuclear arms treaties, NATO policy, and cybersecurity. 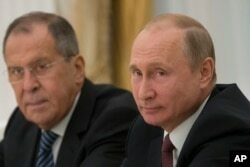 FILE - Russian President Vladimir Putin, right, and Russian Foreign Minister Sergey Lavrov attend talks with U.S. National security adviser John Bolton in the Kremlin in Moscow, Russia, June 27, 2018. Trump's domestic foes fault him for shying away from criticizing Putin personally, arguing it gives credence to claims made by a former British spy that the Kremlin holds compromising information on the U.S. president. Trump has angrily dismissed the claims. European officials worry Trump may during his meeting with Putin offer to axe planned NATO war games in Baltic in a gesture of goodwill. On Thursday, the U.S. President said: “Well, perhaps we'll talk about that.” In June, Trump shocked South Korea and Japan by telling North Korean leader Kim Jong-un during their meeting in Singapore that he would pause joint military exercises. 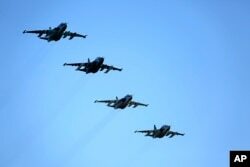 FILE - Russian Su-25 ground attack jets prepare to land after return from Syria at a Russian air base in Primorsko-Akhtarsk, southern Russia, March 16, 2016.